The 9th Annual, 1st unofficial, Marshall Clark 4 Miler was held under blue skies with about 30 competitors toeing the line to keep this run alive. Three time winner Hari Iyer ('03, '05, '07) and 2009 winner Kevin Liao (who broke the string of Iyer's odd year wins) were both on the line with Iyer wanting to get back to his winning ways in the odd years. Fresh off a 2:28 Boston Marathon time this past spring, Iyer was ready to roll (although he almost missed the start of the race). Liao was looking slim and trim but there was no "smack talking" going around so I had to do the honors for both of them. Karen Wai (2009 winner) was also back on the ladies side as well as some other young hopefulls. After a moment of silence, the runners were off. Liao, Iyer and Lynbrook alum Gene Burinskiy seperated themselves from the chase pack during the first lap and a half on the track before heading out on the roads. The first mile, with a slight downhill, made the pace seem comfortable for the leaders as they seemed to talk the entire way. Kristine Johnson (a senior at Saratoga this year) joined Wai as they too established themselves as the ones to beat for the ladies crown. The positions didn't change much through the second downhill mile but once the race turned off of Cox and started to head back uphill to campus, the chase back went after the leaders. An un-marked course and talkative runners will always spell disaster. Just before three miles the leaders missed a turn and by the time they all realized their misfortune and doubled back, the lead pack was now five and not three. A slight push by the ladies up the last hill brought the lead pack to seven and it was obvious that all concerned decided to let the race unfold on the track for the last 300 meters, where such things really should be decided. As the lead changed many times over the last 200 meters, it was Burinskiy who grabbed the inside lane with Liao in lane two, making a perfect box for Iyer that he was unable to get out of. As arms were pumping and legs were moving it was really anyones race but the smooth form of the former Viking 800m runner prevailed. 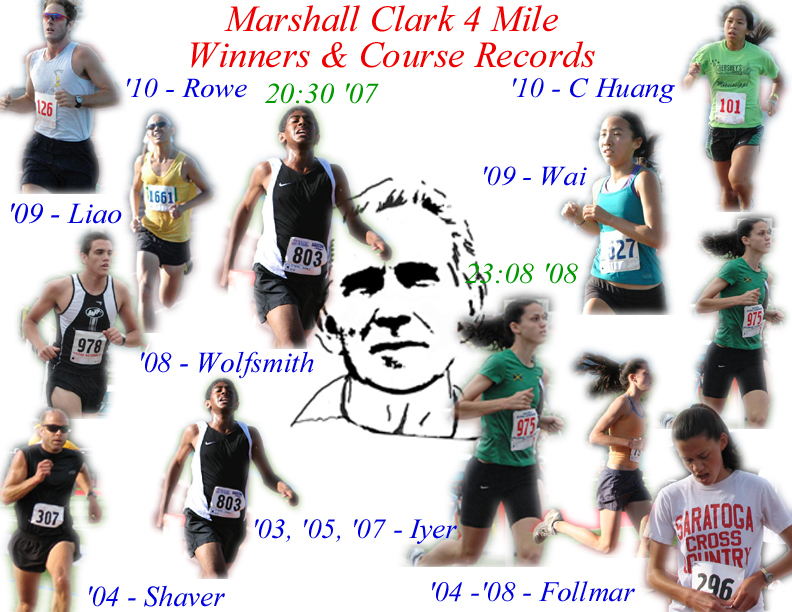 Gene Burinskiy became your 2011 Marshall Clark winner, with Evergreen alum Kevin Liao grabbing second, with a winning time of 28:38 for this four mile course. In all of the excitement of the men's race were the ladies who were no more then steps behind their counterparts and I believe Wai prevailed over Johnston but I could be mistaken since this reporter was trying to finish the first of his MC4 race after timing all of the other previous versions. Plans are to try and bring this event back, officially, in 2012. 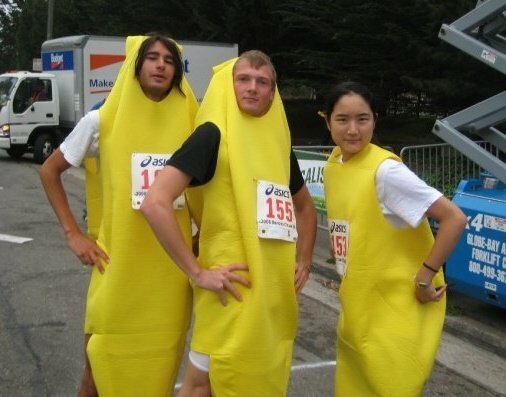 Gene Burinskiy is flanked by Lynbrook alums Luca Signore and a Lady Vike in the 2008 Banana Chase.